5.1. Gjør deg klar til å bli en entreprenør! An entrepreneur is seen as a person who set up a business / an organization, and he/she is taking on the financial risks in order to gain some profit for himself / herself or /and for the community as a whole. The definition hides behind a lot of other characteristics an entrepreneur should have, in terms of attitudes, knowledge, and skills. An entrepreneur is seen first as a risk-taker, and as an innovator, a person able to spot the needs / the opportunities in the community, and respond to these in a profitable and sustainable way. How people become entrepreneurs? Some are natural risk-taker and innovators, other learn to be entrepreneurs, developing specific attitudes, knowledge and skills. Education, Audiovisual and Culture Executive Agency, from European Commission, prepared a specific framework for entrepreneurship education, in Entrepreneurship Education at School in Europe. National Strategies, Curricula and Learning Outcomes (2012, available at: http://eacea.ec.europa.eu/education/eurydice/documents/thematic_reports/135en.pdf, p. 19). These are seen as the basis attitudes for all the other attitudes, knowledge, and skills needed by a would-be entrepreneur. Other entrepreneurial attitudes needed to be developed are: taking the initiative, risk taking, creativity and problem solving. Entrepreneurial knowledge: economic and financial literacy, knowledge of business organisation and process, and knowledge of career opportunities and world of work. Entrepreneurial skills: practical exploration of entrepreneurial opportunities (ex. : designing and implementing a business plan), and communication, presentation, planning and working in team skills. The current toolkit, and also the other online resources created within the YourKITE project provide scenarios that are focused on developing most of these essential attitudes, knowledge and skills, such as self-awareness / critical thinking, creativity, problem solving, basic economic and financial knowledge, entrepreneurship as a career path, knowledge on aspects related to running a business (business model, decision making, negotiations, production, leadership style, etc. ), and communication, presentation, planning and working in team skills. The following section will provide you the basic information on the attitudes, knowledge and skills developed through the entrepreneurship scenarios available in the toolkit. While the information is mandatory to be read when preparing the workshops on entrepreneurship, it also can be used as basic knowledge for you to learn about entrepreneurship. Let’s start! Entrepreneurship Quotient is a coefficient, which can be measured to diverse tests. These tests will never predict your success in business! The tests will just tell you if you have, at the moment of the test, some of the qualities / abilities needed to become an entrepreneur. The test used in this toolkit is adapted from the quiz from Start Your Own Business, Sixth Edition: The Only Startup Book You’ll Ever Need, written by Inc The Staff of Entrepreneur Media; the test was initially developed by Northwestern Mutual Life insurance. Most of the time, successful entrepreneurs prove not to be top achievers in school. Entrepreneurs are not especially enthusiastic working in teams, and as youngster they prefer to work alone. Entrepreneurs are determined / stubborn, and they are ready to take risks, and act less cautiously. Entrepreneurs get bored quickly, they move from one project to another nonstop, and they are ready to put their savings in the next project. Still most of the entrepreneurs handle cash flow properly and they have the habit to write down their goals. Usually, the entrepreneurs are optimistic, characteristic that make it easier for them to take risks. Once again: having a high Entrepreneurship Quotient does not mean automatically that one will succeed in his/her own business, but one may have the qualities / abilities it takes to become successful, while working hard for developing the business. Spotting the needs or the opportunities in the community is a very important step in generating a business idea, but the way in which an entrepreneur responds to these depends a lot on entrepreneur’s creativity. Exercise your creativity everyday, by using creativity tests or exercises, such as alternative uses test, incomplete figure exercises, or by solving riddles, or logical problems. Now, creativity is very useful in business, but more important is innovation. While creativity means to create something original or unusual, innovation means to create something that is both new and valuable to others. Thus, innovation means to put your creativity in practice to solve problems, respond to specific needs, address opportunities, etc. Critical thinking means making reasoned, well thought out judgements, based on logic, evidence, and on an analysis of alternative possibilities. Critical thinking involves curiosity, the willingness to find more information about something, and to be open to new ideas; it also requires scepticism, the healthy questioning attitude; and finally, it implicitly includes the humility, the ability to accept that you are wrong, if there is evidence contradicting your ideas. Critical thinking is essential in business. Curiosity and scepticism help entrepreneurs to challenge the status quo, find new solutions to problems, investigate the market, adapt to new environments, spot new opportunities, etc. Also, a person in constant searching for facts, and not opinions, is a person who can manage well ambiguity, and complexity of the market, supply chains, customers’ demands, stakeholders’ interests, etc. A critical thinker can easily analyse the market environment, the competitors, the customers, he/she can realistically assess the potential and seize the opportunities, and he/she can make prompt decisions. At the same the, a critical thinker can quickly admit when he / she is wrong or has failed, and start over again. At this moment, a classic entrepreneurship manual will introduce you to the business plan, and how to organize your business. By contrast, we recommend you first to get to know your clients / customers, and design your product according to their needs, or to the opportunities you spotted. You learn things about your clients through what is fancy called “market research”. This is just the analysing process, through which you build the profile of your customers: age, gender, married / single, average income / high income, less educated / very educated, employee / business owner, and the list of characteristics can continue… but it is important to find those characteristics relevant for your product idea, those characteristics that make the customer to buy your product or develop an interest in your product. You might say it is hard to know what will make people to buy something, and you need a lot of resources to thoroughly investigate the issue. So, another option you have is to create your “prototype” product, and see how people react to it. Do they like it? Do they say they need it? Do they ask already for the price? To receive the first feedback, you could organize a focus group with people who you might think they could become your buyers. Present them the product, let them “test” it, and see what they think about it. Or try to sell your first samples or give away some “samples”, and ask for people’s suggestions for different aspects, starting from the product name to product’s usefulness for them. Before start selling your products, you have to put a price on them. The price can be set up by using the production costs and adding the profit you want to make. At the same time, mainly in the service businesses, the price can be set by analysing how much customers will pay for your product / service. Moreover, prices are highly determined by what happens on the market in regards to demand and supply. When on the market the demand is high, people buy more of your products or similar products from your competitors, and people believe and perceive that there is a shortage in these products. Thus, the prices will increase. However, when your products or similar products are too many on the market, so the demand is low, while the supply is high, the prices decrease. Thus, in these conditions of high supply and low demand, your competitors will start reducing the prices, in order to make people buy the products, and you might need to do the same, if you want to sell your products… or you should rethink your product / service or offer, for instance you might think to “differentiate” your product by adding some buying incentives, such as increase in quality, provision of additional services or special warranties, etc. Keep in mind that people evaluate products / services that they will buy looking to the quality and the prices of the products. Thus, you might want to position yourself as a enterprise that can provide more quality than the competitors, while having the same prices; or that you can provide the same quality products, but at lower prices; or, in the best case scenario, that you can provide more quality at lower prices. Moreover, when you think about prices, and what your customers pay for your products / services, pay also attention to the opportunity costs that your clients might have: such as the costs they might have with the time they consume to buy a product, transport costs – to go in the store, or at your office to get the product, giving up to buy other products / services, or embarrassing costs (if they have to admit they have a problem when buying your products, such as a specific medicine drug, for instance). Thus, finally, only your customer will know the final price of the product bought from you. Profit is essential in business. This is the first goal of any entrepreneur. Making profit should be your first priority in your business idea. This does not mean that you will become a ferocious capitalist! Not at all, it means you want to develop a sustainable business, a sustainable organization. Profit proves your business is running alright, and that you have the resources for further investments and for further projects. However, before making profit, you want to make sure that what you sell covers your production costs. Now, let’s understand your costs. Any business costs are of two types: variable and fixed costs. The variable costs are those costs that vary accordingly with the quantity of the products you produce. For instance, if you open a bakery, some of your direct costs will be represented by what you pay for the ingredients you use in baking the cakes. If you cook more cakes, your direct costs related to the ingredients will increase proportionally. The fixed costs are those that stay the same no matter how many cakes you cook… for instance, you still have to pay the rent for the bakery shop, no matter how many cakes you cook in one month. Here, you can also include the costs that are hard to show how exactly they vary when you cook less or more cakes. For instance, the costs with the electricity you use for your business. You know that it varies somehow with the number of cakes you make, but it is hard and too much time consuming to calculate it. So, it is better to include it as fixed costs, using a monthly average for it. Now, you need to calculate your break-even point, which represents the number of products you need to produce and sell in order to cover your production costs; that means that you need to see how many “cakes” you need to make per month / per year so that your total revenues will equal your total costs. Thus, in this case, the entrepreneur should produce 1000 of his / her products to cover his / her fixed costs (of 2000 euros/month), and the variable costs of 3 euros/product. The break-even point is essential in making decisions regarding prices, and also regarding the optimization of the production. It brings a pragmatic view over the costs you can afford, the price you need to establish for your products, and over the work you and your employees need to make in order to make some profit. Thus, the entrepreneur needs to make and sell 1250 products in order to get 500 euros profit. These estimations, for break-even point and for certain profit, are the basic financial tools any entrepreneur should be able to use. These help you then to build the estimated budget and the cash flow for your business, and support you in forecasting costs, production, number of employees needed, etc., and in developing the sales strategy. The entrepreneur should think to the customers he / she wants to serve (customer segments). Try to identify the all groups / segments your business could reach to through the products you want to sell, but also through the key resources and partnerships you might need, and the key activities you want to develop. Now, start with the first group (segment) of clients. Think what you can provide to these clients (services, products, relations, etc. ), so think to what is your value proposition for them; what is the value you can bring in their life. Then, decide on how you can provide the value, through what channels; how your products / services get to your customers. These type of channels, and the type of values you proposed make you to decide what kind of relationship (customer relationships) you want to establish with your customers (direct, indirect, online, face to face etc.). Then, you need to make decisions in regards to the price you put on your products, and on the mechanism you are going to use for being paid by your customers (revenue streams); what and how this specific segment of customers will pay for the products / services they receive; what kind of discounts / offers you might provide, etc. You should think now to the resources you will need to create, deliver and capture value for your clients and for your business (key resources). These could be financial resources, human resources, infrastructure for production and selling your products, etc. Then, you need to decide what will be the main activities you need to conduct in order to create and deliver the value (products, services, relations, etc.) you promised to your segment of customers (key activities). In order to get to the key resources, and perform the key activities, you will definitely need some partners (suppliers, public authorities, business partners, etc.). These partners could represent one of the next customer segments your company might have. Finally, define your costs (fixed and variable) for running the business, and try to identify the specific costs you have for delivery value to the specific customers segment you selected. When you finish with one customers segment, you should continue the planning with the following segment of customer, starting from the value you want to provide them. You might see how roles changes from one segment of customers to other… a type of customer could become a partner in delivering value for another type of customer of the organization. 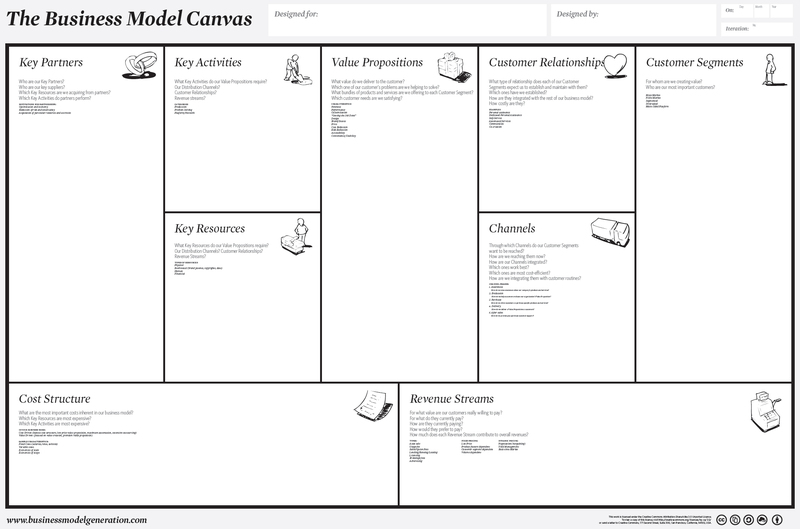 The business model canvas can also be used in planning a project, or an activity, or an event. It is a planning tool, while serving both for management and entrepreneurship goals. Societal contribution – a business should support the local community, by providing resources (financial and in-kind) for achieving development goals; it could invest in education, social, or environmental programs developed by local action groups or by nongovernmental organizations. Moreover, a company should respect some general principles recommended by structures such as United Nations, or European Commission. For instance, the companies should respect and assume as their own principles the ten principles developed by the United Nations Global Compact, which focus on aspects, such as human rights, labour rights and principles, environment and anti-corruption measures. Thus a company should respect, promote, and protect human rights, and it has to make sure that its suppliers and partners also respect human rights (principles 1-2). Then, a company should eliminate, if it is the case, all forms of forced labour and child labour, and also any type of discrimination (this applies also for its suppliers or business partners), and the company should support the freedom of associations of its employees for collective bargaining or unions (principles 3-6). Moreover, a company should be more environmentally responsible, use environmentally friendly technologies, and be aware and precautionary about the environmental challenges it encounters (principles 7-9). Finally, any business should eliminate and work against any form of corruption (principle 10). Developing and adopting a code of conduct helps your business to prosper while it is building and maintaining good and sustainable relations with your stakeholders. This type of ethical and responsible behavior helps your business on long term, gathering the support of the community, increasing the number of clients, raising profit for your shareholders, while creating added value for the society you operate in.